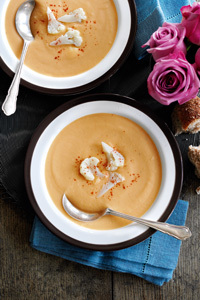 Enjoy this low-calorie winter warming soup from Slimming World. 1. Spray a large sauce pan with low calorie cooking spray and add chopped onion and smoked paprika and cook for 5 minutes. 2. Add cauliflower florets, around 200ml vegetable stock and simmer for 15 minutes until the cauliflower is just tender. 3. Stir in 2-3 extra light cheese triangles and blend until smooth. Season and serve. Please note all foods in bold are ‘free’ foods.